Atlanta Wedding Planner | Laura Birney Events Blog | Atlanta Wedding Coordinator: LBE is a Wedding Industry Experts 2014 Honor Roll Member! LBE is a Wedding Industry Experts 2014 Honor Roll Member! I am honored to have been selected for the Wedding Industry Experts 2014 Honor Roll! The WeddingIndustryExperts.com team asked Wedding Professionals around the world - "Who has inspired you in your local wedding community?" After reviewing email referrals from across the globe, they put together their first annual list of Honor Roll members and I'm happy to announce that Laura Birney Events is one of them. It's because of my wonderful clients that I get to do what I love and to meet so many other wedding industry professionals. I appreciate this recognition and want to give a huge thank you everyone who has supported me! 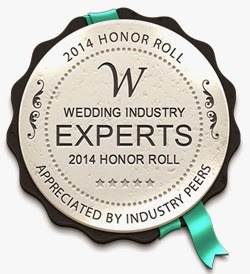 "Wedding Industry Experts 2014 Honor Roll member businesses are a mixed bunch. Much like wedding rings, each one sparkles in its own way. No matter how you count their differences, members have a few things in common – they love the wedding business, they are committed to their clients and their testimonials from both peers and happy clients speak volumes about their commitment to their fields." You can see the full list of Honor Roll Members here. This post is really helpful for those who are looking for wedding services. But the problem is I am looking for birthday restaurants to host a birthday party of my daughter. It is really nice to find your awesome post of useful stuff. Thanks and keep sharing such informative post with all. Your post is really helpful and gives us best information on Event Planner. Yeah planners play an important role in planning of every occasion!! !! It’s really usefull tool for event planing. Have you enjoy the party of event service contact us :- The business event planning company is many such topics which can be communicating to available in the advertisements. The christmas party planning company following up of the advertisements can help in completing the whole work and give a good judgments to the event planning company process. Here it is all discussed as well as there the mentioned topics are all completed as it is recorded and changed event service company out.